We have a broad range of experience as a commercial building restoration contractor in San Diego. Our commercial restoration portfolio includes any exterior surface in the commercial real estate industry. We have been labeled as commercial building restoration experts by our peers, our clients, and other commercial restoration contractors. High and low rise commercial structures require restoration from time to time, due to excessive exposure to the elements. There are few architectural materials that will never require some sort of renewal or restoration. The most common surfaces to require building restoration services are glass, metal, and stone. Focusing our commercial building restoration services on these three main elements has allowed us to train our building restoration service providers to safely and effectively restore these surfaces. We are firm believers that after performing commercial building restoration, it is important to focus on building preservation techniques including weatherproof coatings, and planned maintenance procedures. Glass restoration can be performed to remove hard water stains from the glass surface. Also included in our commercial glass restoration portfolio is scratch removal. We can remove surface scratch removal caused by abrasive glass restoration compounds, or deep scratches caused during construction clean up, or painting procedures. Our building restoration portfolio would not be complete without providing glass restoration and glass renewal services. Precast stone restoration is especially important when biological staining or efflorescence is present in the stone. Additionally, when the stone material is leaching onto adjacent glass, it is important to restore and protect both surfaces. Our restoration technicians are professionally trained to perform glass restoration services to perfection. Brick and Masonry require a slightly different restoration method. Brick restoration can be required due to deterioration of the mortar joints. Brick restoration includes cleaning and sealing the brick, but often tuck pointing is required to properly maintain the envelope. Tuck pointing is an important form of weatherproofing brick. Concrete restoration is an important part of commercial restoration services, mainly due to the fact that it is one of the most common building materials used today. We can effectively restore any type of concrete, and provide concrete repair services. Polished stone restoration is not for the inexperienced restoration contractor. Often, severely deteriorated polished stone requires using progressively finer grit material, in order to effectively restore the surface, and return it to a high luster. 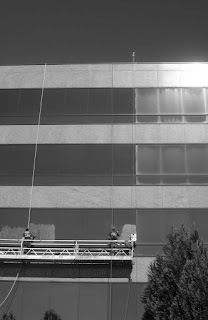 Metal restoration can include the restoration of anodized aluminum window frames. Often restoration contractors will recommend coating anodized aluminum window frames resulting in increased future maintenance. We can also restore stainless steel and composite aluminum panels. Commercial property restoration can require commercial restoration services on one, or a number of materials, in order to reach total building renewal. Many building restoration contractors only address one of these typical architectural materials. Our commercial restorations portfolio covers them all, resulting in a full architectural restoration. Weatherproofing services include keeping moisture and air from passing through the exterior envelope. Weatherproof coatings may be applied to particularly porous building materials in order to better protect and maintain the envelope. Commercial weatherproofing in CITY is cost effective and reliable due to our commercial weatherproofing services. Other weatherproofing applications include caulking control joints, caulking window frames, and wet glazing. On large scale restoration projects, these areas often fail resulting in large amounts of water presenting itself on the interior of the window systems. Why Choose Our Building Restoration Company? We know you have a choice when it comes to selecting building restoration companies. Give us a call to discuss an itemized proposal outlining your specific building restoration and preservation needs. Building restoration is our specialty, especially building restoration involving the complete restoration of high-rise buildings that are covered in stains on the glass, precast and metal frames. We have been providing building restoration services for years, and have an exemplary successful track record. Building restoration is a broad term which makes up a variety of restoration and coating services. We perform glass restoration services, metal restoration services, and stone restoration services. We want to be your building restoration contractor of choice, and recognize what it means to truly provide excellent service. We take pride in encompassing the entire exterior envelope in our building restoration service profile. While performing building restoration services, we focus on high quality, lasting solutions which can be performed safely and effectively. We are an innovator in the building restoration industry in regards to implementing new product technology and service methods. While we are building restoration specialists, our building restoration company has performed a host of other commercial services including maintenance, consulting, project management, and weatherproofing.